The monument was erected in honour of the indigenous peoples who lived in the Hawkesdale District. Hawkesdale is located within the traditional lands of the Maar Peoples, who are the traditional owners for most of South Western Victoria. This society continues today and includes people such as the Gunditjmara, the Kirrae Whurrong, the Djab Whurrung, and the Peek Whurrung. Kaawirn Kuunawarn (Hissing Swan), who was also known as King David, was the `chief` of the Kirrae Whurrong tribe. He witnessed the arrival of the first European in the area. Kaawirn Kuunawarn had a close association with the former Kangatong Station, a large station that encompassed the area in which the township of Hawkesdale now sits. 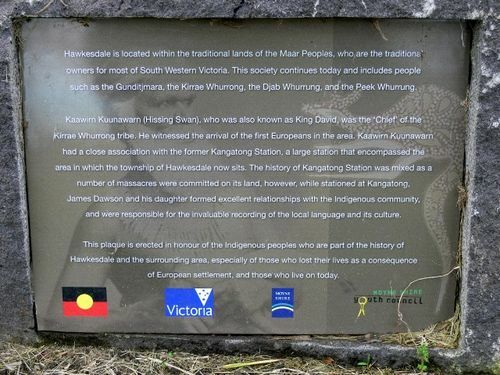 The history of Kangatong Station was mixed as a number of massacres were committed on its land, however, while stationed at Kanagatong, James Dawson and his daughter formed excellent relations with the Indigenous community and were responsible for the invaluable recording of the local language and its culture. This plaque is erected in honour of the Indigenous people who are part of the history of Hawkesdale and the surrounding area, especially of those who lost their lives as a consequence of European settlement, and those who live on today.